Our 2010 Emily C. Specchio Ambassador grant is awarded to Janet Latuga, a senior marketing major at Fairfield University. The grant will support Janet’s project involving the selling of crafts by artisans from Mayasa, Nicaragua to help support and expand their business. 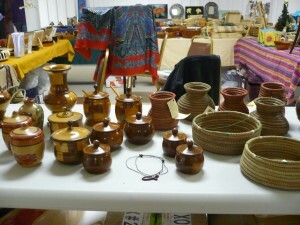 Families that live in the rural sector of this small city have passed on the traits and skills required to produce crafts of varying size, shape, and detail; however, despite the extraordinary talents of the artisans and quality of their products, their impoverished location restricts their ability to sell to bigger markets. Janet learned of this community through a research project with Professor Tellis of Fairfield, and took on the task of helping the artisans expand their market by importing their crafts and selling them at various events in the US. Janet traveled to Mayasa in February 2010 to meet with the artisans in person, as well as meet with Nitlapan, the microfinance institution that works with the artisans to fund their work. Her goal with our grant is to allow the artisans to expand their businesses by importing their items to the US and to make this model sustainable at Fairfield after she graduates. We recently spoke with Janet and learned even more about her past experiences, project updates, and goals for the future. Q: How did you learn of the artisans in Nicaragua and where did you get the idea for your project? 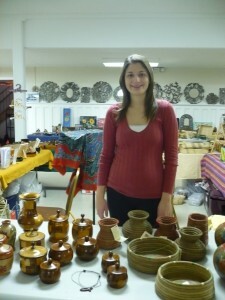 Janet Latuga: I learned about the artisans in Nicaragua from Professor Tellis. He is an information systems professor in the School of Business at Fairfield University. He also was the person who gave me the idea to bring the crafts here and sell them at campus events. My freshman year, he had brought in a selection of the crafts and sold them at one event he ran. I remembered him telling my class about the crafts, so when he suggested that idea for my project, I thought it was a terrific. Q: You traveled to Nicaragua to meet the people in these communities face to face. Describe what you saw during this trip and how it may have changed your outlook of the world. JL: Meeting the artisans was an unforgettable experience. Their houses had dirt floors and wild dogs running throughout the area. Their houses where all very close together, and they did not have the large property space that can be found in the U.S. It really made me realize all the things I take for granted. I never thought about the importance of hard wood floors or insulation. I take air conditioning for granted, but these luxuries are not afforded to the families I met. It made me realize that people in America live a very sheltered life. We don’t realize what it’s like for families in other cultures and countries. Q: Describe how your project makes an impact for the artisans and their communities in Nicaragua. JL: The artisans were looking for an outlet in the U.S. They wanted to find a way to sell more of their crafts to help their business flourish, and my project does just that. I’m not taking profits from the items I sell. I use the money from the crafts I sell to re-order more products from them. They need more outlets to sell their crafts in order to make a living, and I created that for them. Q: Your goal is to make this project sustainable at Fairfield. How do you plan to make this a reality? JL: My goal has already started becoming a reality. I’ve already spoken to two student groups on campus about my project, and I have begun to get volunteers. I’m also speaking with the faculty of the school of business in December about my project. I hope that they will be able to get a class involved in managing and maintaining my project. They recently added an entrepreneurship concentration to the school of business, and I feel as though my project would be a great project for one of those classes. Q How can others follow your progress and contribute to this project? 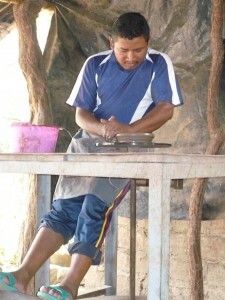 JL: I’ve started a blog online at http://nicaraguancrafts.wordpress.com/. This is a great way for people to see what I’ve been doing and offer suggestions. Q: How has the Emily C. Specchio Ambassador program helped you to make this community service project a reality? JL: The foundation has been a great help to me already. I just started my blog this year. I had never even thought of the idea until I was involved in the Ambassador program. I also was not doing any fundraising before because I did not have the help of a foundation, but now through the program, I’ll be able to raise money to leave future students with enough capital to keep my project going. The Emily C. Specchio Ambassador program is committed to empowering young people to make a difference. Thank you for you support of our foundation that allows programs like this a reality.